Let’s have a closer look at their current site, which at first glance isn’t in too bad of shape, with a No. 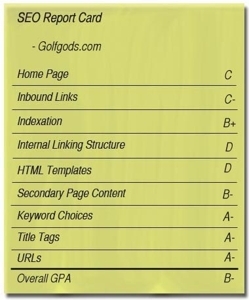 6 position in Google for “golf clubs” and a large number of pages indexed. Their web server responds to www.golfgods.org without doing the proper kind of redirect to www.golfgods.com, resulting in duplicate pages in the engines (e.g. 67 pages in Google). Inbound links of any real importance are in short supply. The Google PageRank score for the home page is 4 out of 10, which is quite low considering that PageRank is on a logarithmic scale. The home page contains hundreds of links, which is way more than Google’s recommended maximum of 100 per page. At the bottom of the home page is a “Products” link leading to a long page of nothing but internal text links. Such pages look designed to be spider food and as such are not as desirable to the search engines. Too much keyword repetition in “invisible” parts of the home page – e.g. “golf” and “clubs” 3X in the title tag, 6X in the meta description, and 12X in alt attributes (actually only 7X for “clubs” in the latter). Meta keywords tag, at 31 words, is too long. Should be half that. From the home page, the brand pages were only available through a dropdown nav (remember: spiders can’t fill out forms). The most popular brands should be text links. Target other golf terms, such as “golf gifts” and “golf glossary” and terms you’d find within a golf glossary. The names of the featured products in the middle of the page should be text, not graphics.